Rima Hygimis 2()iM.09.0E 21:23 UT Age 21 days. 10-ln f/6 Newtonian + 2.SX + 1.6X + ToUcam, 47 frames. 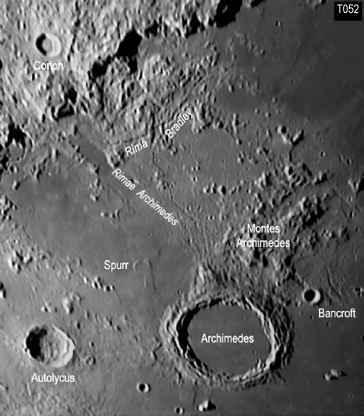 The crater in the middle of the rille is Hyginus. It is rimless, has flat floor and hence appears volcanic rather than impact-created. Presumably Hygintis Is volcanic, it would be a lava outlet and the riile would be a lava channel. 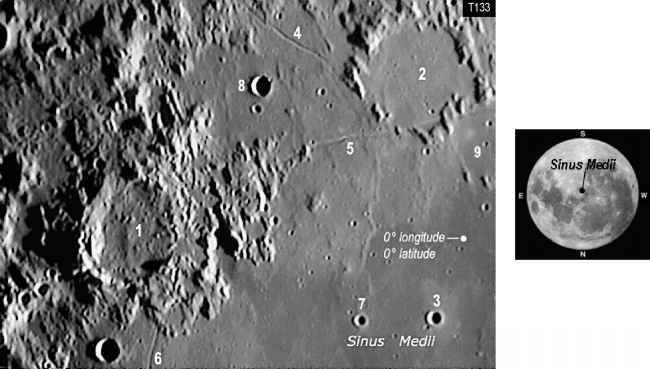 A pair of joined craters near Sinus Medii. They appear like the Greek alphabet O. Both have disintegrated walls. 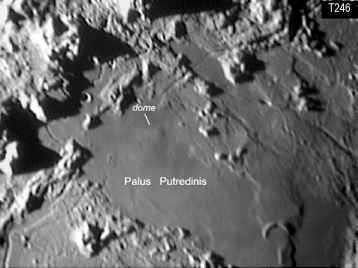 Pallas is 46 km in diameter and Murchison is 57 km with an internal dome. A crater, 18 km in diameter. Rimae Bode (length 70 km) runs northwards from this crater. 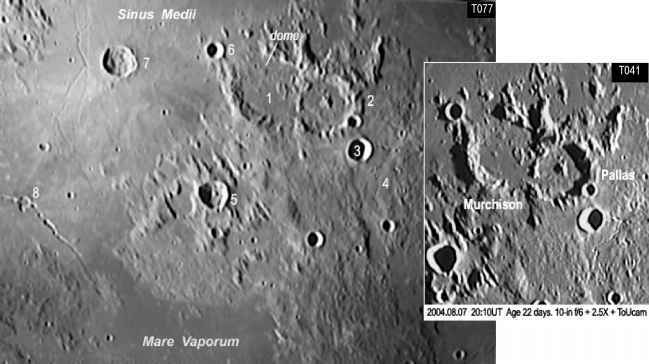 Rhaeticus 4.90 E 0.0 0 N A crater with ruined wall, 45 km in diameter. A bowl-shaped crater in Sinus Medii nearest to the zero-point coordinates, 6 km in diameter. Remains of a crater, 52 km in diameter. 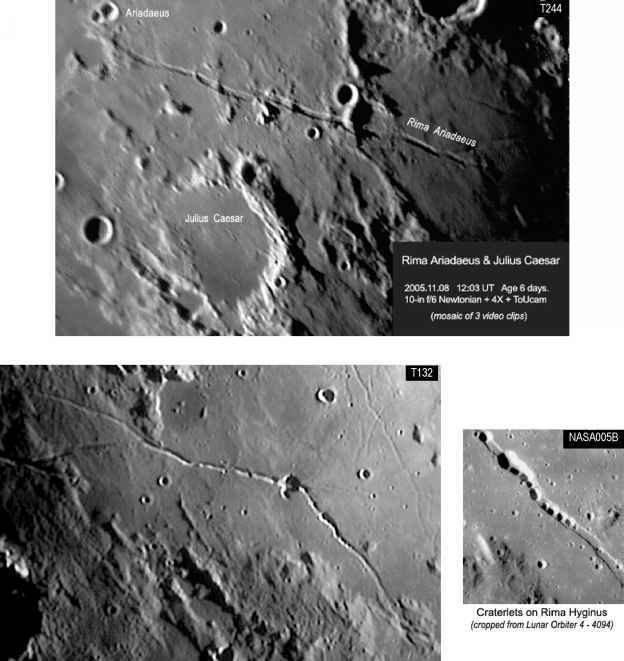 Part of its rim is lava-flooded and interupted by Rima Reaumur (length 30 km) and Rima Oppolzer (length 94 km). 1. Murchison J.Pallas 3. Bode 4, Rimae Bode 5. Ukert 6. Chladni 7. Triesneeker 6, Hyginus 2005.05.17 11:43 UT Age &days. 10-in f/6 Newtonian + 2.5X + ToLlcam, 85 frames stacked, 90% resized. Godin 10.20 E 1.80 N A rayed crater under high illumination, 34 km in diameter. It is fairly irregular, with rough floor and a central peak. 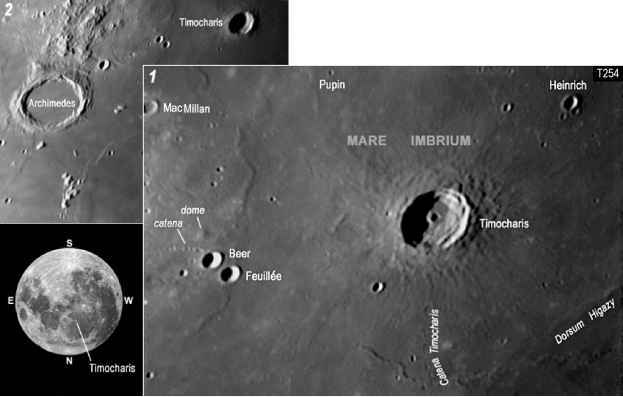 Agrippa 10.5 E A crater with central peak, 44 km in dia. 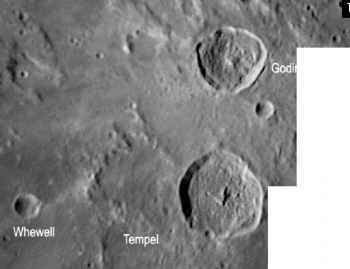 Tempel 11.90 E 3.90 N An irregular, disintegrated crater adjoining Agrippa, 45 km in diameter. Lade 10.10 E 1.30 S A pentagonal flooded crater, 55 km in diameter. Its southern wall is nearly overwhelmed in lava. The Moon's equator is between Lade and Godin. A flooded crater, 26 km in diameter. 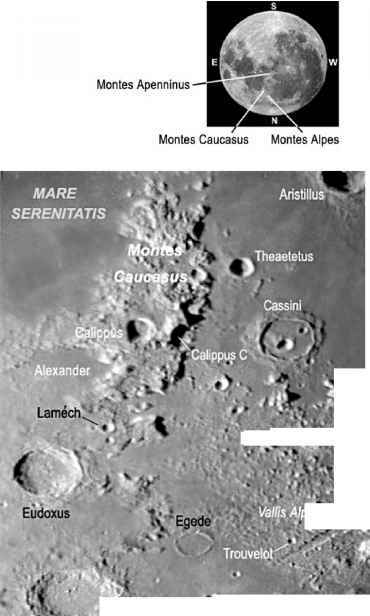 Montes Apenninus is very bright at days close to the full moon. Sinus Aestuum (Bay of Billows) is a mare-like lowland where its eastern edge is the slopes of Montes Apenninus, 290 km in diameter. Its floor contains concentric wrinkle ridges. A prominent crater on Apenninus, 21 km in diameter. 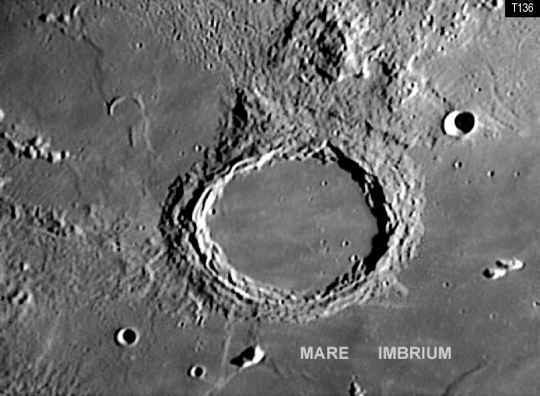 Some people guessed it could be an "oversized" secondary crater produced by the gigantic Imbrium impact. A sinuous rille (Rima Conon, length 30 km) is in the vicinity. An irregular shallow crater on the southern slope of Montes Apenninus, 21 x 28 km. A sinuous rille which begins at the elongated crater Bêla (2 x 11 km). It is a typical lava channel, 80 km long, 1~2 km wide, 300 m deep. On 1971.07.30, Apollo 15 landed on the eastern side of this rille, near Mons Hadley Delta. See Image T137. Rimae Fresnel 4.00 E 28.00 N A system of rilles, length 90 km. A closer view is shown in T137. The main rille appears to be a continuation of Rima Hadley. It ends near the spiky cape Promontorium Fresnel. Montes Spitzbergen 5.00 W 35.00 N A group of adjoined mountains with peak height up to 1400 m, base 60 km. Palus Putredinis 0.40 26.50 N Palus Putredinis (Marsh of Decay) is a small mare facing Montes Apenninus, east-west span 160 km. It contains a dome, noticeable only under low sun Pa|JS putredinis 2005.11.09 12:41 UT Age 7 days. 1WnreNwrfarian + 4X + ToUwm angle. A r c h ¡me d 8S 2004.09.05 21:40 UT Age 21 days. 1 fl-in fffi Newla nlan + 2,5X + 1,6X t ToUcam, 69 frames stacked. Archimedes 4.00 W 29.70 N A flooded crater with terraced walls, 82 km in diameter, 2100 m deep. Its large size suggests central peaks once existed, but they were buried by post-flooding of lava on the floor. The ejecta blanket of Archimedes is also buried partially in lava. This makes the crater rim to look bulgy. A prominent triangular cape extends 30 km from the southeast rim. Montes Archimedes 4.60 W 25.30 N A mountain range adjoining the south rim of Archimedes, length 160 km. 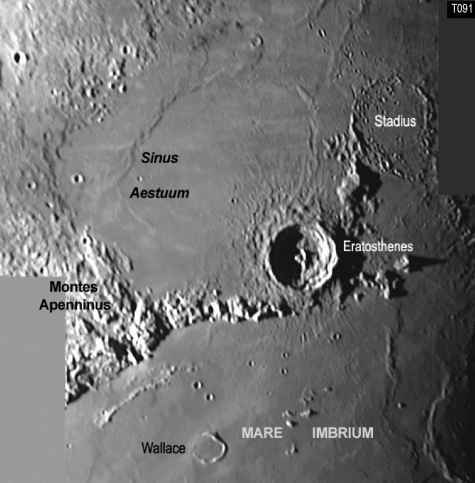 It might be part of Montes Apenninus 3.8 billion years ago, before Mare Imbrium was formed. Rimae Archimedes 4.10 W 26.60 N A broad system of rilles running between the south-east of Archimedes and Montes Apenninus, length 170 km. At least two rilles of the system are recognizable in small telescopes. Spurr 1.20 W 27.90 N Remains of a flooded crater, 13 km in diameter. Autolycus 1.50 E 30.70 N Aristillus 1.20 E 33.90 N A prominent crater pair in the Apenninus region. 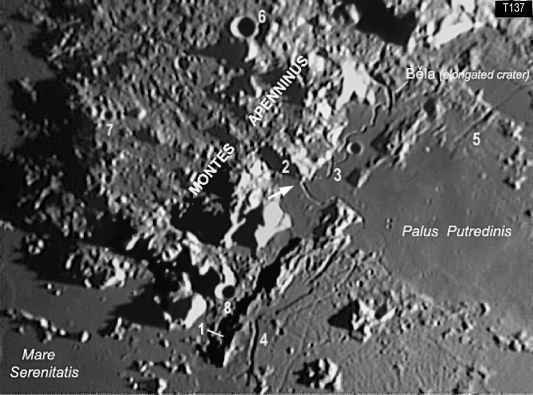 Autolycus has a rough floor with disintegrated central peaks, 39 km in diameter. 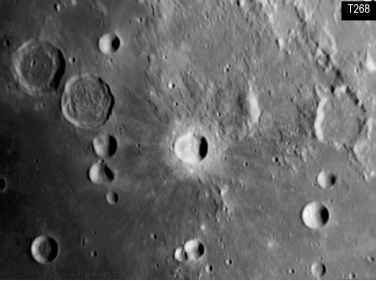 Aristillus has wide ejecta blanket, terraced inner walls and multiple central peaks, 55 km in diameter. A ghost crater is also beneath the ejecta blanket of Aristillus (shown in Image T120, Map 15|.) Both craters are centers of bright rays under high illumination. 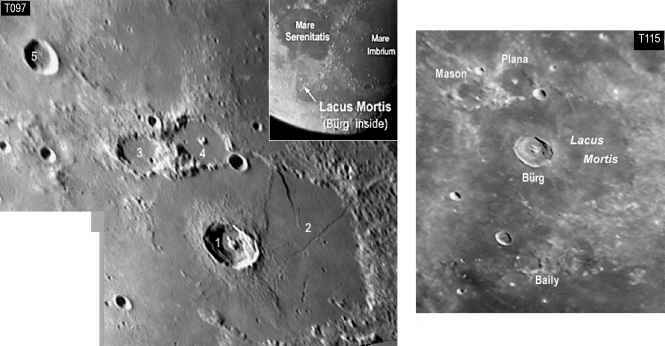 In 1959, the Russian Luna 2 probe hit the Moon near Autolycus and Sinus Lunicus (Bay of Luna). Luna 2 is the first man-made object to reach the Moon surface. A sharp rim crater with terraced inner walls, 33 km in diameter. The central floor has a small crater that lies on a slight rise. Timocharis is a rayed center under high illumination. A chain of craterlets, about 50 km long. It is barely distinguishable in Image T254. 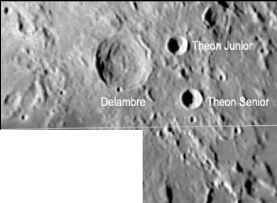 A close pair of bowl-shaped craters, each about 9 km in diameter. Note the nearby dome and catena which are noticeable only under very oblique sunlight.